Pool Guard brand Pool Fencing is Different - It's Stronger, Safer and ASTM Certified! Warning All Pool Safety Fencing is not created equal! With a pool fences and Pool Fence Gates, the safety of your child depends on it ! There are several "Pool Fence Manufacturers" in Tampa and elsewhere claiming to be the greatest and the strongest but the reality is that most of them simply resell an imported, low quality product and work out of a truck or home garage. They often copy the Pool Guard name with a like sounding name and website....And most go out of bussiness within a year! Leaving their customers without a warranty or servicing of any kind. These Copycat companies can be found on web boards like Craigslist and usually offer extreemly low prices to entice you to call. What you typically end up with is either a bait and switch type sales pitch or a low quality pool fence with no A.S.T.M certifications. Protect yourself: Do your homework, some companies have only been around for a few months. Check www.sunbiz.org and research the company name and see how long they have been in business. Then Check out www.BBB.org. Are they a member? Probably not. My legal Company Name is: Pool Guard of Tampa Bay, Inc. Check me out too! When deciding what company to protect your child, don't be fooled by a copycat name or a too good to be true low price, demand american made Pool Guard brand fencing and an installation company with a proven track record of safety and success. Pool Guard Manufacturing our Master Company has been producing Pool Fencing in Tampa Bay for over 18 years and is has an excellent reputation throughout the Pool Fence industry and Tampa Bay community. 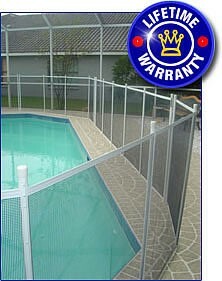 They back their Pool Fencing with a Lifetime Manufactures Warranty. This reputation is backed by an "A+" rating with the BBB and Top ratings with Angie's List. Pool Guard of Tampa Bay carries premium grade ulta transparent mesh. This mesh is the strongest manufactured in today's market and has proven itself to last in the extreme heat we experience in Tampa Bay Florida. This American made mesh is rip-resistant, mildew-resistant, fade and shrinkage-resistant. Pool Guard mesh is ASTM Certified and comes with built in UV inhibitors, they are not sprayed on or heat pressed on which can evaporate over time. Instead, they are inner woven inhibitors. The mesh is double woven and offers twice the visibility as other types of mesh. A Pool fence is easy to use and can be removed in minutes by an adult. Pool Guard's lightweight pool fencing is a tension based pool fencing system that can be installed on many surfaces including concrete, cool decking, pavers, tile, travertine, stone, grass and dirt. Installation of our mesh swimming pool fence requires the drilling of small holes. Once the pool fence holes are drilled, we insert UV protected plastic sleeves into the holes. The pool fencing is then sized and installed into the sleeves. When your pool fence is removed, color-coordinated caps or plugs are provided to cover and protect the holes. We recommend you keep your swimming pool fencing up through out the year but we understand that part of the appeal of our mesh pool fencing system is that it can be removed. To remove our mesh pool fence you simply release the tension by undoing one of the spring loaded safety latches and remove a pole from its sleeve. The mesh swimming pool fencing can then be rolled to the 2nd pole, 3rd and so on, until your swimming pool safety fence is completely removed. Pool Guard Fencing exceeds all Florida codes for swimming pool safety. 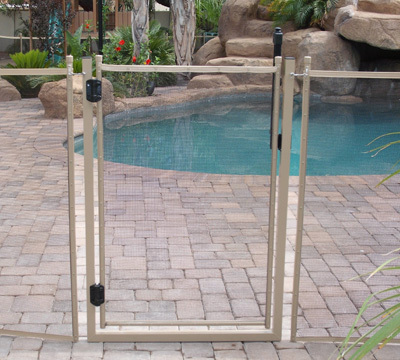 = Our optional self closing pool gate is also easily removable. Pool Guard has the top rated, self-closing, self-latching and key-lockable gate on the market today! It is available in multiple colors and comes in 4 foot or 5 foot heights. With over 15 years of experience in manufacturing and installing pool safety fences, Pool Guard has tried various types of gates for strength and durability. With tens of thousands of gate installations nationwide, We have found that in order for gates to stay within adjustment, the gate should not be tension reliant on the pool fence. That is why Pool Guard actually builds their gates in a framing system. This allows the gate to stand alone, or be monolithic. It's not tension reliant, thus it is designed to stay within adjustment which means better protection against accidental drowning.